Is Candice Pool Lesbian ? The South African beauty Candice Pool is a popular Jewelry designer who has a company named FINN Jewelry which she founded in 2005. She is a successful designer who is great at both clothing & jewelry and has opened her clothing line named Billy. Candice Pool is also known for being the wife of popular YouTube star Casey Neistat who has 10 million subscribers on his channel. Candice Pool is a married woman who tied the knot to YouTuber and Filmmaker Casey Neistat on December 29, 2013. Candice Pool was born on October 19, 1977, under the birth sign Libra in South Africa. She grew up in Texas and later on moved to New York. Pool used to work as a bartender before she gained fame. Growing up she was very practical and her behavior depicted that she will become a successful person later on. Her earlier job includes selling self-made plastic and rhinestone earrings going from door to door. She wished to become a Jewelry designer and thus, became one. Candice Pool is a creative director and jewelry designer of her self-made company named FINN Jewelry. She launched the company in 2005 and it went on to become a huge success. She has made an Instagram profile of her company FINN Jewelry and she posts the pictures of her jewelry consisting of earrings, bracelets, necklaces, and rings there. Candice Pool sells various customized designs of jewelry like Animal Collection, Emerald Leaves Necklace, Custom Souvenir ring and so on. Candice Pool and Husband Casey in their YouTube video. She was nominated for a CFDA/ Vogue Fashion Fund Award in 2011. Many people visit her Jewelry Company and some huge celebrities like Taylor Swift, Karlie Kloss, and Naomi Watts are among her clients. 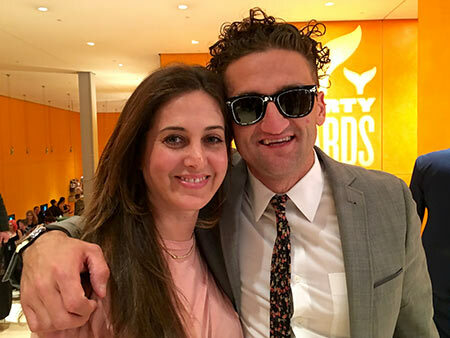 Besides she has appeared in some projects of her husband consisting of Neistat Brothers and Casey Neistat Vlog which she did in 2010 and 2015 respectively. She has appeared in his YouTube channel several times. Candice Pool has entered in the fashion designing world as well and has a clothing line named Billy. It is a unisex line which offers clothing and accessories brand for people who prefer simple styles like casual shirts and blouses, funky jeans and high tops. The South African beauty Candice Pool is estimated to have a net worth of $1.5 million according to various sources. She has a Jewelry company which is very successful. Her company provides various designs of jewelry whose price ranges according to the design. Her diamond heart necklaces' price ranges from ($150 to $4200) while her Animal collection ranges from ($410 - $9800). Her Emerald jewelry collection's prices range from ($375- $4200). Her YouTuber husband Casey Neistat has an estimated net worth of $12 million. His major source of income is from his YouTube career where he has around 10 million subscribers and 2.3 billion total views. Candice Pool is a married woman who tied the knot to YouTuber and Filmmaker Casey Neistat on December 29, 2013. The wedding happened in the Grand Beach Cafe in Cape Town, South Africa. They chose Grand Beach Cafe as their marriage location because of its amazing view, food and also because the people over there didn't really interfere and let the guests do whatever they please. As for her wedding dress, she wore a Reem Acra gown which had a structured bodice and a cut tulle A-line skirt with light beading. After the ceremony, they had Peri Peri Chicken, crayfish and Seafood platters for dinner and performed on the song Crimson and Clover for their wedding dance. Her husband Casey had approached her formerly for a date to which she refused but their marriage proves that they really are a meant-to-be couple. Surprisingly the couple had married before in 2005 for a month and in 2013 they remarried. The couple has a beautiful daughter named Francine Neistat who was born on December 6, 2014, and is pregnant with her second baby. The delivery date is said to be around October 2018 and her daughter Francine is already excited to welcome her younger sibling whom she calls Watermelon. 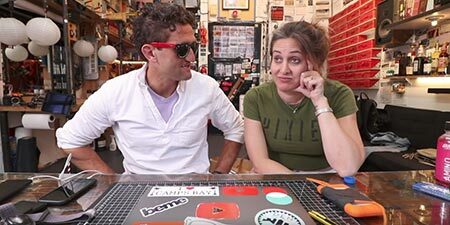 Her husband Neistat has a teenage child named Owen with his former high school girlfriend. The couple married in a private ceremony in 2013 in Grand Beach Cafe in Cape Town, South Africa. Casey Neistat and Candice Pool gave birth to their daughter Francine on December 6, 2014.